Last week the benchmark US dollar index climbed to 98.1 ending its strongest week since mid-May. Yellen’s testimony midweek helped to concentrate minds that interest rates are likely to rise towards the end of the year, once and possibly even twice. Treasury yields nudged down on the week suggesting that recent moves were not driven by markets revising their outlook on interest rates. Gains in the dollar were mostly at the expense of the euro, the Canadian dollar and the Japanese yen. The dollar made its strongest gains versus the yen since May. 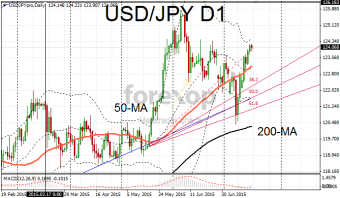 USD/JPY jumped back above 124. The pair encountered support and resistance at the classic levels, namely around the critical 200/50 moving averages and the Fibonacci levels. 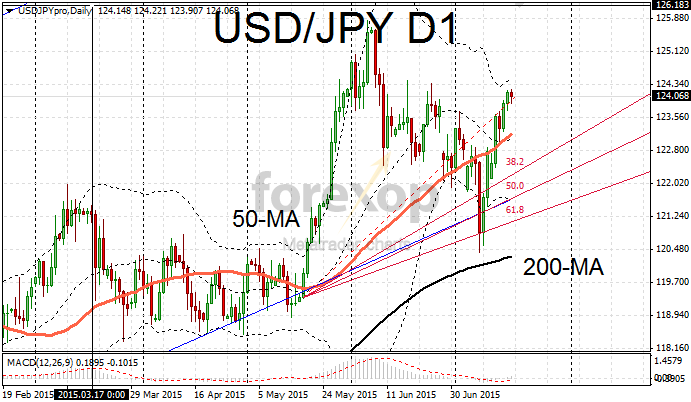 USD/JPY is likely to receive support at 123.25 as the 50-day moving average ascends in an upwards path. The pair is sitting at a resistance level so some consolidation and retracement could be in order. The yen typically sees some support when oil prices are weak. However the BOJ’s latest statement did little to reassure markets that officials are being overly optimistic around inflation targets and growth. Monetary policy is being held firm for now but there is scope for further easing down the line if these targets are not being achieved. In the US consumer inflation met with expectations in June. Consumer prices were up 0.1% on the previous month according to figures from the US Department of Labor. This makes a rise of 0.1% on the inflation number for May. Core inflation which excludes food and energy was up 0.2%, also showing a rise of 0.1% on the prior month. Strong results from the housing market are adding to demand for the greenback. Housing starts were up to 1.174M units in June beating expectations by 47,000 and up 9% from May. The latest data brings the level of new construction up to activity levels before the financial crash in 2007.